Steve Frieze Removals Wallington is a family run, removal business established in 1970 in Wallington, Surrey. It started with a single van, advertising in local papers as ‘man with a van’. We offered a cheap and cheerful service for removals Wallington. From this humble beginning it became obvious that one man was just not sufficient. We were undertaking a huge amount of removals business. Since then removals company has grown to the present level of 8 removal vans and 10 employees. By the early 90′s the business had expanded and Steve recognised the need for larger premises. He purchased the current office and storage warehouse premises in Princes Way Croydon. The acquisition of the warehouse opened new areas for the business to grow. Steve Frieze Removals Wallington is rightly proud of its reputation for quality in the home removals and storage market. It intends to maintain and build upon these firm foundations by continuing it’s policy of fair pricing and quality performance. Working, primarily, in the Surrey/Kent catchments area our distinctive removal vans with the flag and company colours are easy to recognise. However, we service all areas of the United Kingdom and have partners in BAR to help with any international move. We will be happy to offer a free quotation from Lands End to John O’Groats and beyond. Please feel free to click our contact link, complete the simple form and we will phone you. Our office is open from 08:00 hours to 18:00 hours Monday to Friday. Our office manager will be happy to discuss any specialised requirements or arrangements that might need. Our survey will cover all necessary aspects of the move. If it is easier for you, then it is easier for us! Steve Frieze Removals Wallington are proud of their commitment to providing excellent removals services at affordable prices. To future and existing customers, your comments regarding our service and our website will always be appreciated. 1970 Steve Frieze owns a grocery shop in Reigate Surrey and is regularly asked about the use of his blue transit at weekends. He lends the vehicle to a friend and asks what are you doing with it the man replies small removals and then he gets the idea to start this for himself. 1972 Steve starts working for Courts the furniture shop in Croydon and employs Steve Bleach and Steve Dean in assisting with deliveries. 1980 Steve has now bought several vehicles and is parking them in a car park in Coulsdon. 1986 Steve leases his first warehouse/ yard on Thornton Road Carshalton (The Trading Post) This is where he employs Eric Proctor, Mark Gibbons and Dave Gibbons who are his new drivers and estimator. 1990 Steve has to move to new premises as the lease has expired at Thornton road. His new warehouse is in Grey Hound Road Sutton where he employs Darren Bosher and Shaun Winchester. 1991 Steve once again is on the move to another warehouse which is in Oval Road East Croydon. We are not there for long as the warehouse is being knocked down for housing re-development. 1992 Steve moves to his current warehouse in Croydon 3a Princes Way.This is where he shares the building with Dave Green another removal company and also shares with a company that sells records (Juke Box). 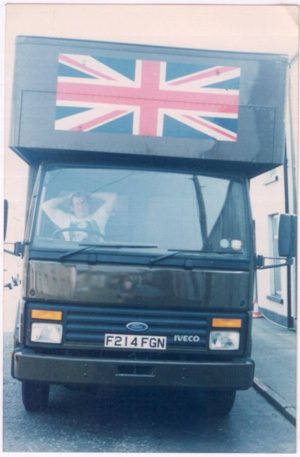 1994 Steve employs John steed and Stuart Hunt as his new drivers and as the year goes on along come more staff members. 1995 Steve employs Mick Gibson to assist in running the office with Erik proctor and purchases his first 18 tonne vehicle. 1996 Steve goes to auction to purchase 3a Princes Way. 2000 Steve Frieze celerbrates 30 Years of business. 2002 Steve builds new offices inside of the warehouse. 2007 Eric Proctor retires as office manager. 2012 Shandor Hallett and Darren Bosher forge a partnership into Steve frieze removals and incorporate BOXTAG Fine Art Transport. 2013 Steve Frieze becomes a member of the British Association Of Removers. 2014 R.I.P Mick Gibson works to the end. 2014 Steve Frieze becomes a member of Checktrade Trade and continues to grow from strength to strength.